Being a solopreneur is NOT easy... especially when it comes to all the BUSINESS-y side of all that I do. You know how it is... you go into photography because you freakin LOVE it, but once it becomes an actual BUSINESS, clicking the camera is a teeny-tiny fraction of what you actually spend time doing. But even with all that other stuff that goes into running a business, I am super PROUD to say that providing a stress-free client experience is one of the things I've come to be known for. And I have to admit, a huge part of my "secret" is that I have Honeybook to keep me on track with it all. I'm not new to using CRM's (Client Relationship Mangement) or CMS's (Client Management Software. In fact, I was with a different company for about 5 years, and have tested out a few others in the meantime, too. But my eyes kept wandering back to Honeybook. They simply seemed to have it all... organization, integrations into my calendar and other important places, reminders, a custom client pipeline, easy emailing, digital contracts and invoicing... and it's PRETTY, too! So I made the switch to using Honeybook as my client management software about 6 months ago, and haven't looked back! Honeybook offers the option to create MULTIPLE custom contact forms, making it SUPER easy to onboard new leads and turn them into clients. 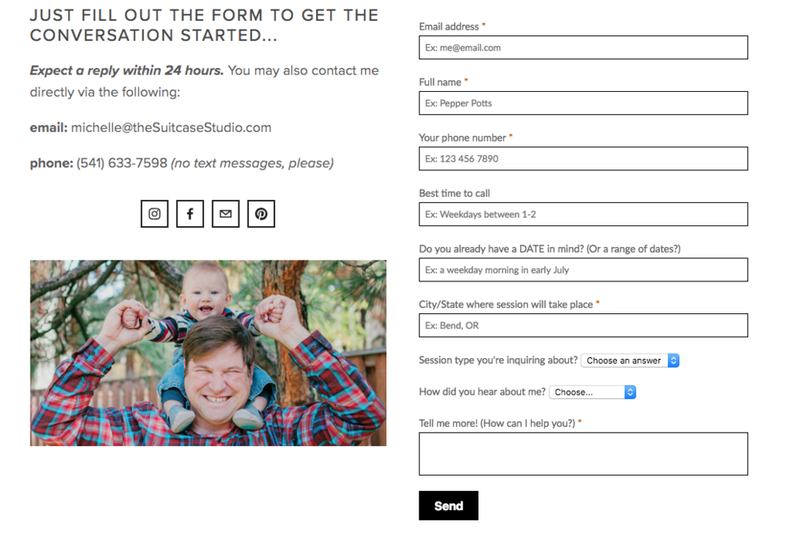 I can quickly create a new form for where I want it to go on my website... meaning that I can ask SPECIFIC questions based on the type of client I'm talking to, whether it's an inquiry for business/personal branding photos, a FAMILY photo session, etc. When someone contacts me via one of my contact forms, they automatically get uploaded to Honeybook as an "Inquiry," and I receive an email notification. I can also easily add a new client or project to Honeybook, and add them to whatever stage of the pipeline I want, too... whether that's an inquiry, I'm sending out a new invoice, or we're already jumping into the planning stages. Honeybook refers to this as the "Pipeline," and it can be configured into whatever steps/sections make sense for you + your business... from inquiries all the way to completion + archiving. This gives me an at-a-glance overview of all the projects I currently have in motion. While I haven't delved into this feature in detail yet, it can AMAAAAAZINGLY helpful of keeping track of step-by-step tasks involved in different types of projects. I mean, you wouldn't use the same to-do list for photographing a WEDDING as you would for a FAMILY or CORPORATE stuff, right? So you can create custom workflows for each project type, and apply them to each individual project, so that you essentially have your detailed to-do list right there and waiting for you! And it's easy to create new tasks and reminders, too. Each Project gets its own workspace within Honeybook, so you can easily see ALL conversations, forms and documents associated with it. Your task list and notes are in there, too. And the CLIENT sees their own version of this workspace, too, with easy access to their forms, questionnaires, conversations, and more! Speaking of keeping track of conversations, I love, love, freakin LOVE this feature!!! No longer do I have to search my inbox for emails coming through from my clients. Instead, I can email them directly from Honeybook, and Honeybook keeps track of all emails sent and replied to... so I never have to search through my inbox again (for stuff like "Where did we leave this conversation?" When do I need to follow up next, etc.). It's ALL THERE in Honeybook. And for those who love backing up their info in multiple places (me, me, me), Honeybook DOES send a copy of the email to your inbox, too. You can even reply directly to the email in your inbox, and have it go straight to your client AND the project's workspace, without having to switch over to Honeybook for this! I'm a BIG fan of the copy/paste method. Let's face it... 99% of the time, we're sending the SAME info over and over again to new clients... so why not create a template for each email + cut your response time in half?! I've got email templates for EVERYTHING... inquiries for different session types, sending a contract or invoice, following up with people, sending questionnaires, prepping my clients for their sessions, etc. The list goes on and on. Now that I'm able to store these templates in one easy place, all I have to do is click a button to create a new email from one of these templates, customize it as needed, and send it on its way! You can also create unlimited forms for questionnaires, invoices, packages, contracts, and MORE! There's even a "Proposal," which combines a brochure, invoice and contract all in one. This has saved me sooooooo much time in the long run, and clients appreciate how pretty + POLISHED it all looks, too! While this may not be a deal-breaker for some, I've found it to be a BIG selling point with my clients. I mean... in today's world, you've gotta make your business stand out in any way possible, amiright? 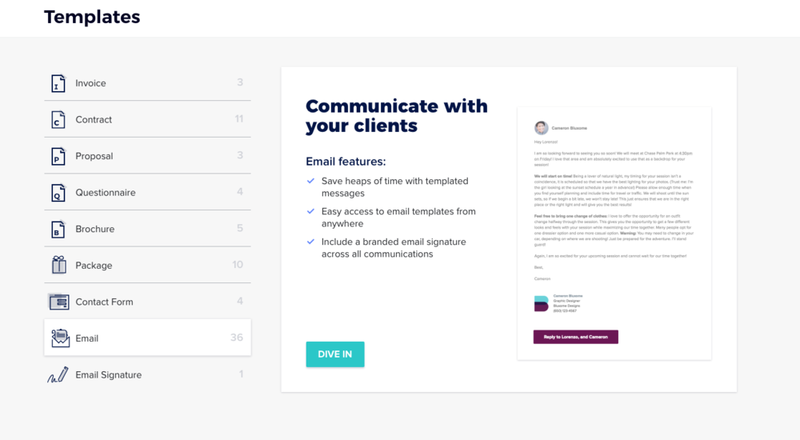 Honeybook lets you customize the look of each workspace and file sent to your client, so you really CAN add your personality + branding to it all. And this adds to your "polished" look, making you look SO much more professional, too! 08: There's a corresponding APP! We live in a mobile world, so it just makes SENSE that Honeybook has an easy-to-use app. Everything is right there at your fingertips, so you can get on-the-fly updates and quickly look up someone's phone number if you need it in a pinch. Honeybook easily integrates with Google Calendar + Calendly (and maybe a few others), which makes it suuuuuper simple to schedule new projects + tasks without having to worry about the dreaded double-booking! Honeybook will even WARN you if there's a possible conflict. 10: Take 50% off your subscription!!! Okay... this is HUGE! Because, I have to admit... I'm a bit of a cheapskate at times, and don't always have the funds to put into my business as much as I'd like. And this is the MAIN reason it took me so long to switch over to Honeybook in the first place. But as an affiliate, they've given me a way to pass on a 50% discount to all new users... regardless of whether you sign up for an annual subscription or even a month-to-month plan! There's even a FREE 14-day trial period, with the 50% savings automatically kicking in if/when you officially sign up. All you have to do is click here to get started. I could go on and on about how awesome the Honeybook platform truly is (and maybe I'll update this post in the future), but this should be enough info to get you started!